But the stories that resonate the most are the ones George tells about his late wife, Mary, who he still speaks of with palpable fondness. “Love at first sight,” is how he described it, showing me his favorite photos of her from their young marriage in post-WWII California. Their first years of marriage were long-distance, with Mary in Minneapolis and Heart Mountain and George in the Philippines. Letters were sent back and forth by Victory Mail. He described how later when they had their home together, they would play a game of Scrabble every night for most of their married life. Lastly, George’s memories of confronting the Japanese military in the Philippines are perhaps the most haunting, bearing the biggest lessons for today. They prove that major decisions of war are never left to those of the people fighting, on the ground, in the thick of conflict. Often, this is where a shared humanity is best understood. Where were you December 7th? I was in the college infirmary. I had the flu. And were you in California? This was in Dartmouth College in Hanover, New Hampshire. See, I went to high school in the American School in Japan. I was there for four years because our entire family moved from Los Angeles to Tokyo in 1935. When I was a kid, I remember sitting at the kitchen table when I was a youngster, and my folks always said to each other, “It’ll be nice to go home to Japan when we get older.” So in 1935, that’s when our whole family moved back to Japan. We left the last week of August, 1935. So your parents wanted to go back to live out the rest of their years in Japan? That would be my feeling. But you know, after we got to Japan and later on, I think my folks felt that they made a mistake. Because my father loved to play golf and all his friends were golfers. That’s how I learned how to play golf. And the weather in Tokyo was bad during the winter, golf was impossible. So the only time you could play golf was in the spring and summertime. And the summer was so hot, it wasn’t much fun. So I always felt my mom and dad made a mistake. How was your experience at Dartmouth? I was the only Nisei on campus but they treated me fine. We were juniors at the time of Pearl Harbor. In retrospect, if that had happened in December of ’39, it might have been different. But after being on campus for two years, everyone knew Nobu [George’s roommate and son of the Mitsui family, owners of a prominent shipping company] and everyone knew George. So there was no outright racism or taunting. But I heard later on that the day of Pearl Harbor, some rednecks accused Nobu Mitsui — it was just words, no physical action. I didn’t hear about that until years later. Nobu never mentioned it to me. Nobu was a very intelligent person. His group consisted of intelligentsia. My group that I ran around with was far from being intelligentsia. We were the sports-minded group. So, a couple of months later in February or March, I was having lunch with three or four of my friends when one of the waitresses nodded to me and said, “George, those two fellows would like to talk to you.” So I went out. They were two FBI agents. And the first thing they said was, “George, what do you think about Takanobu Mitsui?” I said, “What do you mean, what do I think?” They said well, he’s from Japan. And I said, “You mean is he dangerous? He’s harmless.” And later I found out that President Hopkins of Dartmouth was a personal friend of FDR, and President Hopkins told the FBI that he would vouch for Takanobu Mitsui as long as he’s on campus. So, five days after graduation, I was in the U.S. Army. I volunteered but before then in the Spring of ’42. I had a letter from Colonel Rasmussen of Camp Savage, saying after you graduate college, we want you to come to the Military Intelligence Service school. So as you went into the language school, was all your family in Japan? My two sisters had come back to America in March of ’41 and in June of ’41. They were in Los Angeles. But before the evacuation in early ’42, they evacuated to Salt Lake City. They knew they were going to be evacuated so my sisters, Michi and Kazu, moved to Salt Lake City. And about a year later, they both moved to Chicago. They never went to camp. I think one of them worked for a church and another worked as a secretary. So you’re a new recruit at Camp Savage, what do you remember about the first year or so? I think there were three hundred of us there. It was just a non-stop schooling. Military terms, learning the Japanese language, learning the customs. But I had a big advantage, living in Tokyo for four years. When I first went overseas to Australia, that was ATIS. I was in translation but then they found out I had lived in Tokyo and they put me in interrogation. We had about two hundred of us in ATIS. We were sent up to Port Moresby, New Guinea. Later on to Hollandia, New Guinea and Biak Island. That was a godforsaken island between the Philippines and New Guinea. I remember one prisoner telling me something. We were in the army and we were making an airstrip. And the Japanese had been there for over a year and the airstrip wasn’t even half-finished. And he said, “Your army came in and in 10 days, they made an airstrip where fighter planes could land and take off. And in two weeks, bombers could land and take off.” And they said at that time, they knew the war was over for Japan. They were impressed by our bulldozers, earth removers, and combat engineers. Who were you interrogating? Officers or soldiers? Both. But the enlisted men were just there because that’s where they were ordered to be. The officers were very, very intelligent. That’s why after interrogation we’d hang around and when they found out I lived in Tokyo, that made it less formal. I really enjoyed talking to them off the cuff. So you were free to do that. What information were you supposed to get from them? We got a lot of information. See, I wasn’t the strongest in Japanese but I was very strong in English so we were paired up with an expert in Japanese and I was the expert in English. Prisoners of war were never taught what to do if they were captured because they were told to die. We had the invasion on Leyte Gulf and later on we went to Mindanao in the Southern Philippines. And that’s where I was when the war ended. What do you remember about the prisoners and soldiers being kept on the island? When the war ended and they surrendered, the Filipino scouts knew exactly where every large contingent of Japanese troops were located on Mindanao. The camps were always near a lake or a river — that was their main source of food, fish. The commanding general of the 8th army and the general of the 24th division, they must have known something because a lot of the pilots and soldiers would say, “Come on, let’s go in and bomb them out.” The general says, no, just let them be themselves. Then when the emperor announced the surrender and the Japanese soldiers came out, they were carrying a piece of paper that the Niseis had printed out on a mimeograph machine. Tens of thousands were dropped on every Japanese group. Oh yeah. We went out on PT boats on rivers, and we backed in. So that if we had to leave, we were headed in the right direction. We’d be on the radio, saying kosan kosan. Surrender, surrender. Senso owari. War’s over. Dai nippon no tenno heika ga hoso shimashita. The emperor of Japan surrendered over the radio. Say that over and over and over again. It got dark but we went back at noon the next day and I remember where we were the day before. We kept announcing kosan, kosan. I could hear a sailor behind me saying, “White flag, 2 o’clock, four hundred yards.” Those were magic words, I’ll never forget it. And we looked and sure enough we could see the flag waving. And the sailor in our PT boat was waving a flag. And all of our machine guns were pointed skyward and we had fighter planes overhead going up and down. And they had their orders: if a flare went up from our PT boat, they were to strafe a napalm bomb both sides of the river. That’s how the war ended. Then what happened after that – how did the Japanese leave the island? I think about 500 troops came out and they put their weapons on the big pile, and the last to come out were the families of the civilian army employees. They’d been on Mindanao for four years. ’41-’45. We made the landing in February and the war ended on August the 15th. How did all the families look? You never felt so sorry for a group of people in all your life. Their clothes were in tatters. Just never forget it. And the army troops came out, and they hardly had any shoes. They had very little ammunition but they had a lot of rice though, that was their staple. The [U.S.] army generals probably knew the war was ending so they didn’t want to inflict any more damage. A lot of children. Because when the families came down, the children came with the families. And I remember, after the war ended, all the prisoners were in a stockade. It was only a couple of strands of barbed wire. If any of the Japanese soldiers wanted to escape I guess they could. There were about 13,000 prisoners and I remember our outfit had to give up a set of khakis, a pair of shoes and a blanket and everybody went on half rations, since you had all these thousands of extra mouths to feed. Before the war ended, we were staging for the attack to invade Japan. So these big landing ship tanks (LSTs) were on their way to Mindanao so when they arrived, it was the army’s job to get them on the ship to send them back. Did you know that the bombs were going to happen? No, that was on August the 6th. It came over the army radio. One bomb was the equivalent of 20,000 B-17s. And nobody could imagine what an atom bomb could do. But the war was over because that day, all we heard was gunfire. We thought, “My god, are the Japanese troops making a banzai attack?” Everybody grabbed their guns and we all went outside and everybody was saying, “The war’s over, the war’s over!” That’s why they were firing their guns into the sky. I don’t think there was a dry-eye among us. Your family and parents were still in Japan? 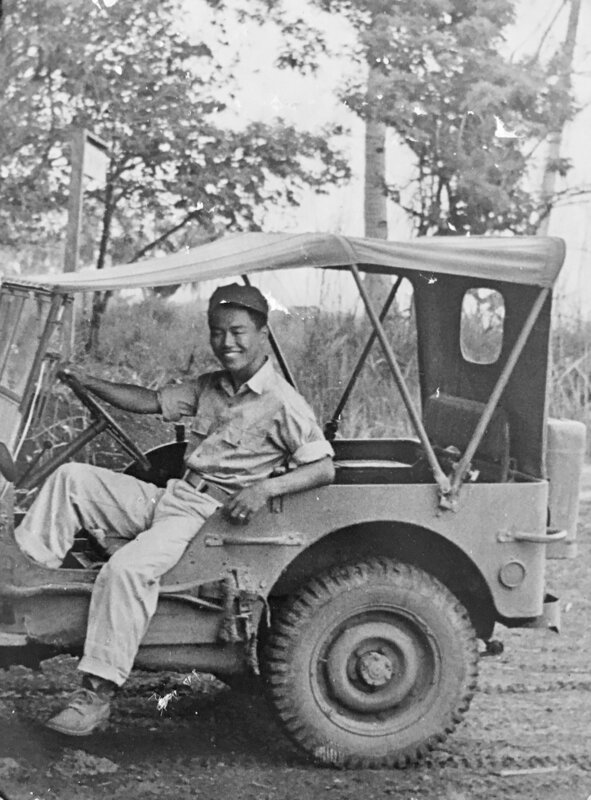 I was on New Guinea and a jeep rolls up in our area and I heard the fellow say, “I’m looking for a George Shimizu.” He introduced himself as being from the International Red Cross in Switzerland and he said he had a letter from my folks in Japan. And he said, “If you want to send a letter to your folks, I’m available,” and he gave me an address. So I talked to one of the Colonels that day and he said, “Of course, write a letter to your folks and tell them you’re okay. We’re at war with Japan, not with your family.” So I dashed off a letter and mailed it. And lo and behold, after the war, they had received the letter. That was really amazing. And that’s why every year I make a donation to the Red Cross. So your family was not affected by the war? No, we had a beautiful home in Shibuya. And we had a summer home in Kamakura. And both of my folks are from Hiroshima-ken. Small village outside of Fukuyama. We lost our home in Shibuya due to the fire bombing. But our home in Kamakura was okay. I remember at ATIS in Brisbane, Australia, in the translation and photo department, they knew everything about Tokyo. They had photo reconnaissance photos and they purposely avoided bombing the Imperial Palace and the business area of Tokyo which was across the canal from the Imperial Palace. Do you remember feeling afraid for your family being in Japan? I had no word but my sisters had told me about the house in Kamakura and said, “I think mama and papa are okay.” This was early ’42. But my dad later died in 1948. I never saw him again after I left to go to school. And then my mother died in 1953. But then our son, Rick and I went to go see my mother in the summer of ’52, six months before she died. That’s good you were able to see her before she passed. How long did it take for you to come back home out of the army? So they treated me and three days later the Major comes by and said, “George, you don’t have malaria.” I had lost count after about eight or nine attacks [of malaria] and they were treating me for that. But I had infectious hepatitis. He says, “You’re too sick for us to handle so we’re going to send you by hospital plane to Leyte.” So the next morning, six of us in stretchers are being put onto a plane and while they’re loading me on I can hear a voice saying, “Hey, who’s that VIP prisoner of war?” And one of my friends says, “That’s no POW. That’s George Shimizu. He’s a Sergeant in the U.S. Army. He’s one of us.” So we wind up in this huge general hospital in Leyte in ICU. I was there for three months and two weeks. I felt good after a couple of months but they wouldn’t release me. In the meantime, my buddies are coming to see me because the war is over and say, “Hey I’m heading for home, George. Good luck!” And I’m in the intensive care unit. I was there until the middle of December. So then the President Monroe comes into the harbor, and 4,000 of us get onboard. So I spent Christmas of ’45 on the high seas. It took us a little over two weeks to get back to San Francisco. It’s a long story. Do you want to hear it? I do, I’m sure it’ll be a good story. This is in June of 1941, before Pearl Harbor, I get to Los Angeles and I’m staying with the Fujisaka family. 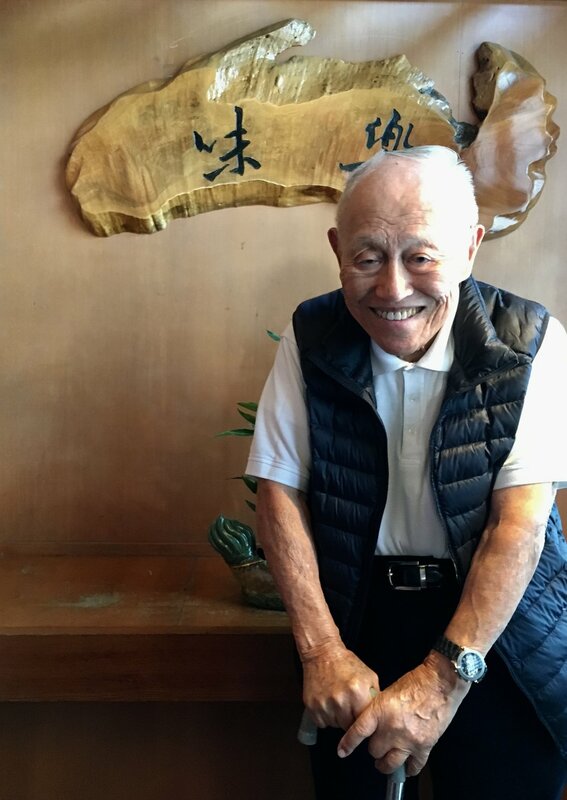 So in those days, there were a lot of Boy’s clubs and Girl’s clubs and George Fujisaka [a friend] was a member of the Shamrocks. And my wife to be Mary, was a member of the girls’ co-eds. So when I showed up in L.A., Mary’s friend called her up and said, “Mary, you have to go Saturday night to the skating party we’re having with the Shamrocks.” She says, “I don’t want to go skating.” But her friend told her that all the other girls were busy, so that she had to go. So Mary says, “Okay I’ll go.” So at the Shrine roller skating rink near the USC campus: “Mary Yamamoto, this is George Shimizu.” And you know, here’s my wife-to-be: pink blouse, dirndl skirt, brown and white saddle shoes. Perfect. Love at first sight. Wow, you remember every detail. But then, Executive Order 9066. She went to Pomona fairgrounds with her family, three months later they wind up in Heart Mountain. And I never got to Heart Mountain. Mary and I were scheduled to go in December and then the army said no, you can’t go because you’re shipping out in the middle of December. So we spent Christmas of ’42 and ’43 together. We left Camp Savage in early ’43. She left camp early as a house girl to come up to Minneapolis where we got married. But her older sister Amy was still in Heart Mountain and Amy later came to live in Minneapolis because they knew the mother and father were safe in Heart Mountain. I think the Issei women enjoyed camp life, from what I heard. Because a lot of the farmer’s wives were feeding the family and all the farm help. Tough job. So when they went to camp, food was prepared for them. Did Mary stay in camp the entire time? She had gone from Heart Mountain to Denver, Colorado as a house girl. She was there for three days and told the lady of the house, “I can’t do this work. I’ve never done housework.” So she left and she went to the WRA office and told the lady there, I quit my job as a house girl. She says, “Mary you have to go back. You’re ruining it for all the other Nisei girls.” So the lady asked her what she could do. Mary said that she could sew. So she went to work making jackets for the U.S. Army. And she was so good that the owner of the manufacturing company said if you have any more people like Mary, we’ll take them all. Then she worked in Minneapolis for two and a half years with a wonderful Norwegian family that took her in. Then on April 2nd, 1943, Mary and I got married. On every Friday night we got weekend leave, and then on Monday morning, we went back to Camp Savage. I think Mary and I were one of the first Nisei couples to get married at Camp Savage. They told me I couldn’t eat in the mess hall with the other guys because I was on rations when we got married. So I had to eat with the Japanese instructors. The crazy thing is I knew a lot of them from Tokyo days. George and Mary, shortly after they were married at Camp Savage. The wear and tear in this photo is worth a thousand words: George kept this photo with him during his service in the Philippines. Let me tell you a story about my wife. It must’ve been about in January or February of ’45. My wife and her sister Amy and a friend of theirs were going to Heart Mountain, which was 500 miles away and on the train going from Minneapolis to Wyoming, this American fellow–redneck–kept teasing my wife. And my wife Mary never said a word. And this redneck was teasing her until her sister Amy spoke up and said, “Hey, knock it off! Her husband’s a Sergeant in the U.S Army fighting in the Philippines and here you are, riding a train in Wyoming. You should be ashamed of yourself.” And the guy looked at Amy and looked at my wife, and he sort of sheepishly walked away. And you know, that train full of passengers said, “Good for you, good for you!” Good for Amy. Absolutely. When you came back to California, how did you and Mary meet again? They had all come back from Minneapolis to Los Angeles. And when I got discharged, they were at the All People’s Church near San Pedro. I had their address because I got a lot of letters from her while I was in the hospital. But I had no phone number. So I found out that a bus went right down San Pedro street and I got off, and I rang the doorbell at 7 o’clock in the morning. And a fellow answers and I said, “I’m George Shimizu.” And he says, “I’ll get Mary.” And Mary came down and you know, we both broke down and cried.